The Jensen JT-MS-8N3 provides 8 channels of extremely high quality 3 way microphone splitting with 48 Volt phantom power individually selectable on each channel. 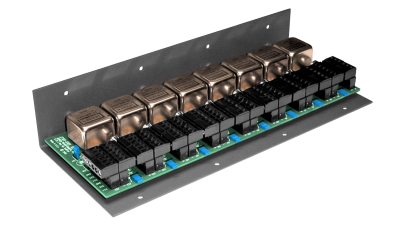 This functionality is provided in a compact 11.35″W x 4.75″H x 2.25″D package allowing 7 units (56 channels) to be mounted vertically on a 7U size rack panel (see Figure 2.4.1). Excellent frequency response and extremely low distortion are provided by the Jensen JT-MB-DPC microphone splitting transformers that are used in the JT-MS-8N3.